Graffiti was scratched into one of the ring's 27 standing stones sometime between Friday afternoon and Sunday morning. 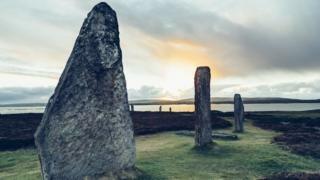 Police Scotland described the stones as "priceless artefacts" and the vandalism as a "mindless act". Insp David Hall said: "I would urge anyone who has visited the area over the last weekend to think back and if they believe they may have seen something suspicious, even if it didn't seem of much note at the time, to let us know. "We would also would urge the public to continue to be vigilant at this site and report anything which could be of interest to police immediately."